Home | Protection and Prosperity Inc.
Brigitte (Brandy) de Grassi is a Registered Representative offering securities through *World Capital Brokerage Inc. Member FINRA/SIPC. Mailing Address: 1636 Logan Street, Denver, CO 80203. Tel: 888-742-0631. Securities related business including *mutual funds and *variable annuities. 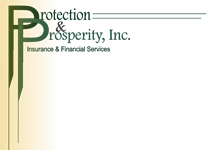 **Protection & Prosperity Inc., 110 East D Street, Suite M Benicia, CA 94510. is not a branch or an affiliated location of World Capital Brokerage.